The entry-level Camry CE trim, also known simply as the Camry, rolls into 2009 with only minor upgrades. The Camry CE comes equipped with a 2.4-liter inline four-cylinder engine that produces 158 horsepower. The engine links to a five-speed manual overdrive transmission, which comes standard, or an optional five-speed automatic. Standard features for the 2009 Camry CE include multi-adjustable front bucket seats, power windows and door locks, an illuminated entry system, cruise control, and a six-speaker AM/FM audio system with a CD player and MP3 capability. Antilock brakes with brake assist, an advanced airbag system, integrated front fog lamps, a tire pressure monitoring system, and high solar energy-absorbing glass also come standard. Drivers have long given the Camry high marks not only for its economy and build quality, but also for its ease of handling, safety features, and roomy interior, as well as its exterior styling. Some have reported an increase in quality issues in the past few years, but given the fact that the Camry holds its value well, the 2009 version should be as popular with drivers as its predecessors. A step up from the entry-level Camry CE, the 2009 Toyota Camry LE adds such features as remote keyless entry and metallic-style interior trim to the list of standard features, when compared to the CE. Other standard features for the 2009 Camry LE include power windows and door locks, cruise control, and a six-speaker AM/FM audio system with a CD player and MP3 capability. Antilock brakes with brake assist, an advanced airbag system, integrated front fog lamps, a tire pressure monitoring system, and high solar energy-absorbing glass also come standard. The Camry LE comes equipped with a 2.4-liter inline four-cylinder engine that produces 158 horsepower. The engine links to a five-speed manual overdrive transmission, which comes standard, or an optional five-speed automatic. As the mid-level Camry trim for 2009, the Camry SE comes with an expanded list of standard features that includes a three-spoke leather-wrapped steering wheel, a leather-wrapped shift knob, Blue Optitron instrument gauges, and special sport fabric. Outside, unique SE features include halogen headlights with black trim, integrated front fog lights, a blackout sport grille, a chrome-tipped exhaust, and color-keyed underbody spoilers and side rocker panel moldings. Available options include heated front seats, an eight-speaker JBL AM/FM audio system with a CD changer, and a voice-activated DVD navigation system. A 158-horsepower four-cylinder engine powers the Camry SE. It links to either a five-speed manual transmission, which comes standard, or an optional five-speed automatic transmission. Drivers and reviewers give the Camry good marks for its interior comfort, safety features, handling, economy, and ease of handling, as well as its exterior styling and build quality. Some have reported an increase in quality issues in the past few years, but given the fact that the Camry holds its value well, the 2009 version should be as popular with drivers as its predecessors. Drivers seeking an affordable Camry with the additional power provided by a six-cylinder engine can opt for the 2009 Toyota Camry LE V6, which comes equipped with a 3.5-liter double-overhead-cam V6 engine that produces 268 horsepower. The engine links to a six-speed electronically controlled automatic transmission. 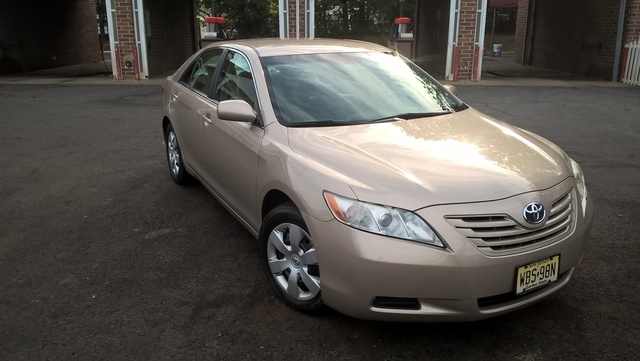 Standard features for the 2009 Toyota Camry LE V6 include remote keyless entry and metallic-style interior trim, as well as power windows and door locks, cruise control, and a six-speaker AM/FM audio system with a CD player and MP3 capability. Antilock brakes with brake assist, an advanced airbag system, integrated front fog lamps, a tire pressure monitoring system, and high solar energy-absorbing glass also come standard. Drivers and reviewers give the Camry good marks for its interior comfort, safety features, handling, economy, and ease of handling, as well as its exterior styling and build quality. In fact, U.S. News and World Report rated the 2008 Camry near the top of a crowded field of affordable mid-size cars (No. 5 out of 27), and those numbers are expected to carry over to the 2009 version, since Toyota made only minor upgrades to the '09 Camry. Some have reported an increase in quality issues in the past few years, but given the fact that the Camry holds its value well, the 2009 version should be as popular with drivers as its predecessors. The mid-level 2009 Toyota Camry SE V6 trim provides drivers with an expanded list of standard features, when compared to the LE and CE trims, as well as a bump in power, thanks to its 268-horsepower V6 engine, which links to a six-speed automatic overdrive transmission. Standard features for the Camry SE V6 include a three-spoke leather-wrapped steering wheel, a leather-wrapped shift knob, Blue Optitron instrument gauges, and special sport fabric. Outside, unique SE features include halogen headlights with black trim, integrated front fog lights, a blackout sport grille, a chrome-tipped exhaust, and color-keyed underbody spoilers and side rocker panel moldings. As the top Camry trim available for 2009, the Camry XLE comes well-equipped with such standard features as a four-spoke leather-wrapped steering wheel, wood-grain-style shift lever, a dual-zone automatic climate control system, an auto-dimming rearview mirror, a sliding center armrest, and an eight-speaker JBL AM/FM audio system with a six-disc in-dash CD changer and MP3 capability. Outside, standard features include a power tilt and slide moonroof, heated outside mirrors, and aerodynamic multi-reflector halogen headlights. A 158-horsepower four-cylinder engine powers the Camry XLE. The engine links to either a five-speed manual transmission, which comes standard, or an optional five-speed automatic transmission. Drivers and reviewers give the Camry good marks for its interior comfort, safety features, handling, economy, and ease of handling, as well as its exterior styling and build quality. Some drivers have reported an increase in quality issues in the past few years, but given the fact that the Camry holds its value well, the 2009 version should be as popular with drivers as its predecessors. Drivers who place a premium on fuel efficiency can opt for the 2009 Toyota Camry Hybrid, which achieves 33 miles per gallon in the city and 34 mpg on the highway, thanks to its 147-horsepower, 2.4-liter hybrid engine. The hybrid engine consists of an electric motor as well as a traditional gas-powered engine. The Camry Hybrid also comes equipped with a number of hybrid-related systems, including a Hybrid Suspension and Hybrid Brakes. Vehicle Stability Control with traction control, and an electronically controlled continuously variable transmission (ECVT) are also part of the package. Other standard features include remote keyless entry, a three-spoke leather-wrapped steering wheel and shift lever, Sport fabric seats, a power-adjustable driver's seat, Blue Optitron instrument gauges, and a six-speaker AM/FM audio system with MP3 capability. Combining V6 power with the most extensive list of standard features available in a Camry, the Toyota Camry XLE V6 takes the honors as the top Camry trim for 2009. Standard features for the XLE V6 include a four-spoke leather-wrapped steering wheel, wood-grain-style shift lever and interior trim, a dual-zone automatic climate control system, an auto-dimming rearview mirror, and an eight-speaker JBL AM/FM audio system with a six-disc in-dash CD changer and MP3 capability. A 268-horsepower V6 engine powers the XLE V6. The engine links to a six-speed automatic transmission with overdrive.